Animation and crystal joined forces to create the six characters the world has adored since the thirties! Falling in love has never been so easy! Mickey, Minnie, Goofy, Daisy, Pluto and Goofy have been through many an adventure together. Stars of countless films, their individual characters appeal to all ages. All of the characters are designed in exquisitely faceted clear crystal. 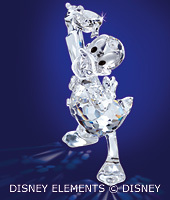 Jet crystal accents define eyes and noses, as well as the ears of Pluto and Goofy. Succumb to the girlish charm of both Daisy Duck and Minnie Mouse or the droll personalities of Goofy and Pluto. 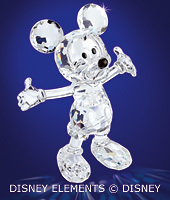 Mickey’s and Donald’s personalities as well have been brought to crystal life – a result of the close cooperation between the Swarovski designers and Disney. Visit the Swarovski collection online for more detail. Visit the WCN Swarovski information pages.